Yesterday I told a Toronto International Film Festival staffer that this city is one of the best in North America for silent film. Not only do we have TIFF Bell Lightbox, our still-new festival theatre, showing silent films regularly with live accompaniment; we also have smaller theatres showing silents in regular rotating programs, plus the Toronto Silent Film Festival, the Toronto Urban Film Festival, and some truly tricked-out rental stores offering obscurities I’ve never heard of until I start to browse. Yes, we’re lucky here in Toronto. New York and Los Angeles may offer more, but they’re an awful lot bigger too. I had this chat at the Lightbox, following a very interesting pair of lectures on the career of Mary Pickford. Profs. Charlie Keil and Rob King educated us (a nearly-full auditorium) on the development of both cinematic acting and the movie star-as-public-entity—concepts that could not be seriously discussed without mentioning Pickford. Sandwiched between the lectures were 35-mm prints of three Pickford Biograph shorts: Wilful Peggy; An Arcadian Maid (both 1910); and The New York Hat (1912). The first film was used to demonstrate Pickford’s mastery of the older, ‘histrionic’ style of film acting; the second, her equal mastery of the developing ‘verisimilar’ style, characterized by fewer outsized gestures and channeling of internal conflict through props. Kudos to Prof. Keil for reminding us that histrionic does not equal ‘bad’, even if we laugh at it now. 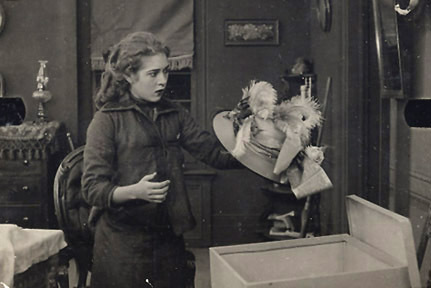 The New York Hat, a 16-minute film and Pickford’s last for Biograph, shows her embracing verisimilitude as fully as she ever would. She plays Mollie Goodhue, the only child of a just-widowed Calvinist-type (Charles Hill Mailes). Mrs. Goodhue, who expires in the film’s opening scene, leaves Preacher Bolton (Lionel Barrymore) a letter: in it she confides that her husband ‘worked her to death’ and begs the minister to spare Mollie that fate. What she really means is that he allowed his wife not the slightest frivolous pleasure, and her daughter, who loves beautiful clothing but doesn’t own a stitch of it, faces the same joyless, frugal life. Preacher Bolton agrees to take a bit of money the mother stashed away and buy Mollie something she’d like, from time to time. The father is not to know. You might wonder how he wouldn’t know, since the Goodhues occupy a tiny house in a tiny village. Soon after, Preacher Bolton discovers Mollie with her face pressed to the window of a shop. The window advertises ‘Hats Just From New York.’ In particular one, ‘The Village Sensation’: a wide-brimmed, feathered, ridiculous confection. She departs, depressed; then Bolton enters the store and buys it. The town gossips see him do it, and wonder what he’s up to. The New York Hat packs considerable tension into a single reel. There are three points of conflict: first, between the preacher and the townspeople, who believe he is carrying on an affair with Mollie; second, between Mollie and her father, who, when he discovers the hat, is enraged; third, between Mollie and her peers, who scorn her for being poor. Were the film longer, I believe there’d be a fourth point, only hinted at here, between Preacher Bolton and Mr. Goodhue. Not only is Bolton usurping Goodhue’s fatherly role; he’s also been privy to the private thoughts of Goodhue’s wife, while the ultra-straight husband likely was not. As D.W. Griffith made The Mothering Heart a star vehicle for Lillian Gish, so too is The New York Hat one for Pickford: she’s in most scenes, and though her Mollie is mostly reactive, she’s also the only character whose emotions ebb and flow with full humanity. Surrounding her are archetypes: Mr. Goodhue with the thin, pinched face and long chin whiskers of a bible-thumper; the town busybodies, overdressed, sneering, and always moving in a cluster; the gentle minister, radiating stillness and peace. Then Pickford: first miming finery in the mirror with her pathetic poor-girl’s hat, then again with the real thing; her face shifting from giddiness to guilt and grief, and then to pleasure: her true emotion once the rest have been refined and eliminated. I’ve seen a lot of Mary Pickford films, and this rapid shifting of feeling is one of her trademarks. Her expressions flowed like water. Readers of this blog know how quick I am to defend the archaic in film: fixed-camera work, broadly drawn archetypes, etc. These things come off phony most of the time, but properly handled, they’re capable of dramatic power, and sometimes work as artistic tools in their own right. For example, here. Pickford’s Mollie is an image of pathos, but an emotionally whole being too, negotiating her way between symbols of bigotry, vice, prejudice and stupidity. They are universals; the tiny town in which they live could be the whole planet; and so Mollie, their victim, is both someone and Anyone. I was moved by The New York Hat. Unlike so many creaky Biograph shorts, it establishes an authentic human character as its centrepoint: didactic, perhaps, but dramatic first, and so we care. Whatever values Mollie Goodhue represents, she also represents Mollie Goodhue, and that little girl deserves to be happy. The New York Hat is one of the most celebrated Biograph shorts. It has also got, arguably, one of the most notable cast and crews of any silent film, short or feature-length. In addition to Pickford and Barrymore, watch for cameos by Lillian and Dorothy Gish, Jack Pickford, Mae Marsh, Robert Harron, and Mack Sennett. Directed by Griffith, it was scripted by Anita Loos, with contributions by Frances Marion. I watched The New York Hat as part of Mary Pickford: From Actress to Icon, a lecture and screening hosted by TIFF Bell Lightbox on May 14, 2011. Accompaniment was provided by Laura Silberberg. 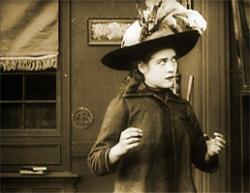 The New York Hat is also available on DVD; part of Kino International’s three-disc set, Biograph Shorts.